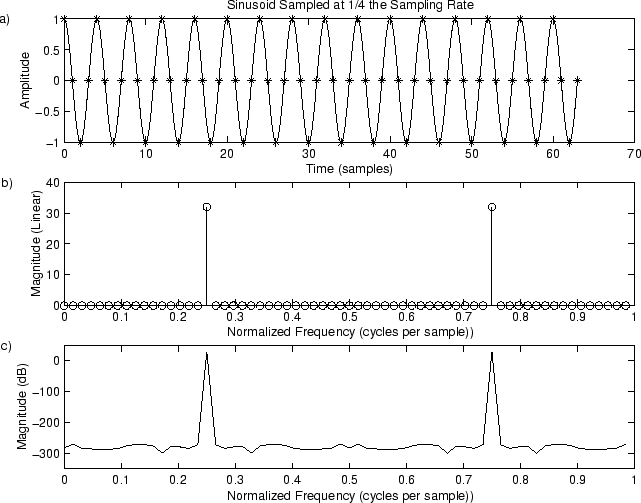 Figure 9.1:Sampled sinusoid at . a) Time waveform. b) Magnitude spectrum. c) DB magnitude spectrum. when . This happens at bin numbers and for . However, recall that Matlab requires indexing from , so that these peaks will really show up at index and in the magX array. The spectrum should be exactly zero at the other bin numbers. How accurately this happens can be seen by looking on a dB scale, as shown in Fig. 9.1c. We see that the spectral magnitude in the other bins is on the order of dB lower, which is close enough to zero for audio work.